Whitefield, NH, New Hampshire, Mountain, View, resort, hotel, golf, course, country club, Spalding, Inn, Spaulding, Kimball, Hill, Astle, king's, square, White, Mountains, Mount, Washington, Regional, Airport, Economic, development, corporation. NH Route 3, Whitefield, NH. Get Amsoil Synthetic Lubricants Products here! I'm working on this section, try all of the links, some of them work! 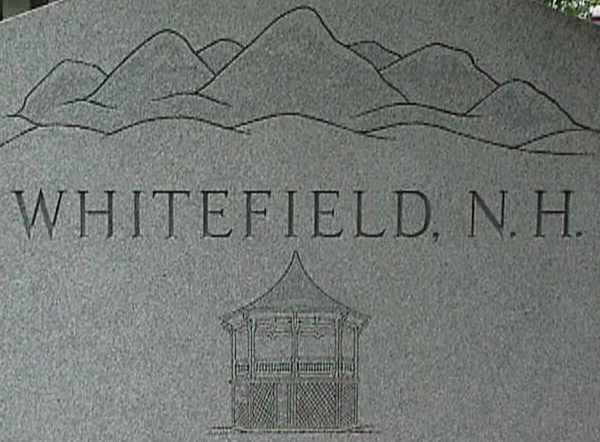 Whitefield Historical Society, founded in 1982 Lower level of the Fleet Bank on the Common. Thursday afternoons, 2 to 4 PM Has a collection of printed and other materials, genealogical info. Here's an interesting letter from Ireland. Denis P. O'Mahony has been kind enough to give his permission to place it here. I was delighted to find your website on Friday night last, 12/5/97. I have been seeking information on Whitefield for the past few weeks since I went online and after finding only small nuggets of information here and there, your website is a cornucopia of knowledge on Whitefield and Northern NH. I have only begun to read its contents, so expect an increase in the number of hits from Ireland in the coming days and weeks! Why am I, from faraway Ireland interested in Northern NH and Whitefield in particular? The answer goes back 28 years. In 1969 I worked as an exchange student in the Mount Washington Hotel, Bretton Woods for a brief period, two weeks, I think, before moving on the advice of Rev. Joe Sands, then attached to St. Matthew's Rectory, to The Mountain View Hotel where I worked for the rest of that Summer. I was young and impressionable, and Whitefield and its people left an indelible impression on my memory. That lovely, homely village in a beautifully wooded countryside of hills and lakes are still clear in the memory. I cherish the memory of the local people for their courtesy and welcoming friendliness to me, a young Irish student thousands of miles from home! During that Summer I helped Fr. Sands with his many projects, including taking local young people up to the top of Mount Washington, on foot no Cog Railroad for us! It is 6,288 feet high: believe me, I know! 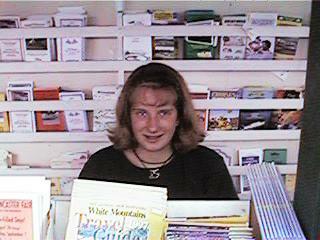 Finding your website has released a flood of happy memories and I am glad to be able to connect again, in more than one sense, with the village of my youth. Time moves on and we must all succomb to change. 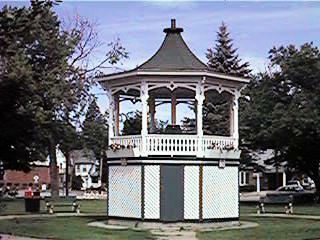 However, looking at the photos on your home page I am delighted that one feature has survived the ravages of time and urban renewal: the bandstand! It was under this, on one hot evening in late July that I tried to catch a greased pig with some others, and failed miserably! It was part of a Féte in the village that weekend. I clearly remember going with Fr. Sands all the way to Colebrook to borrow the pig from a farmer he knew there. Being of farming stock myself helped me tolerate the scent from the back of the Fr. Sand's stationwagon on the return journey! I bet the pig was glad to get back to Colebrook. By the way, I am a secondary school (Senior High to you) teacher of English and Info. Technology here in Limerick. Finally, I wish you and your family and friends and all the people of Whitefield, a very happy Christmas. Copyright 1998, 1999, 2000, 2001 by Ed Sanders. Whitefield, NH, New Hampshire, Mountain, View, resort, hotel, golf, course, country club, Spalding, Inn, Spaulding, Kimball, Hill, Astle, king's, square, White, Mountains, Mount, Washington, Regional, Airport, Economic, development, corporation. Whitefield, NH, New Hampshire, Mountain, View, resort, hotel, golf, course, country club, Spalding, Inn, Spaulding, Kimball, Hill, Astle, king's, square, White, Mountains, Mount, Washington, Regional, Airport, Economic, development, corporation. Whitefield, NH, New Hampshire, Mountain, View, resort, hotel, golf, course, country club, Spalding, Inn, Spaulding, Kimball, Hill, Astle, king's, square, White, Mountains, Mount, Washington, Regional, Airport, Economic, development, corporation. Whitefield, NH, New Hampshire, Mountain, View, resort, hotel, golf, course, country club, Spalding, Inn, Spaulding, Kimball, Hill, Astle, king's, square, White, Mountains, Mount, Washington, Regional, Airport, Economic, development, corporation. Whitefield, NH, New Hampshire, Mountain, View, resort, hotel, golf, course, country club, Spalding, Inn, Spaulding, Kimball, Hill, Astle, king's, square, White, Mountains, Mount, Washington, Regional, Airport, Economic, development, corporation. Whitefield, NH, New Hampshire, Mountain, View, resort, hotel, golf, course, country club, Spalding, Inn, Spaulding, Kimball, Hill, Astle, king's, square, White, Mountains, Mount, Washington, Regional, Airport, Economic, development, corporation. Whitefield, NH, New Hampshire, Mountain, View, resort, hotel, golf, course, country club, Spalding, Inn, Spaulding, Kimball, Hill, Astle, king's, square, White, Mountains, Mount, Washington, Regional, Airport, Economic, development, corporation. Whitefield, NH, New Hampshire, Mountain, View, resort, hotel, golf, course, country club, Spalding, Inn, Spaulding, Kimball, Hill, Astle, king's, square, White, Mountains, Mount, Washington, Regional, Airport, Economic, development, corporation. Whitefield, NH, New Hampshire, Mountain, View, resort, hotel, golf, course, country club, Spalding, Inn, Spaulding, Kimball, Hill, Astle, king's, square, White, Mountains, Mount, Washington, Regional, Airport, Economic, development, corporation. Whitefield, NH, New Hampshire, Mountain, View, resort, hotel, golf, course, country club, Spalding, Inn, Spaulding, Kimball, Hill, Astle, king's, square, White, Mountains, Mount, Washington, Regional, Airport, Economic, development, corporation. Whitefield, NH, New Hampshire, Mountain, View, resort, hotel, golf, course, country club, Spalding, Inn, Spaulding, Kimball, Hill, Astle, king's, square, White, Mountains, Mount, Washington, Regional, Airport, Economic, development, corporation. Whitefield, NH, New Hampshire, Mountain, View, resort, hotel, golf, course, country club, Spalding, Inn, Spaulding, Kimball, Hill, Astle, king's, square, White, Mountains, Mount, Washington, Regional, Airport, Economic, development, corporation. Whitefield, NH, New Hampshire, Mountain, View, resort, hotel, golf, course, country club, Spalding, Inn, Spaulding, Kimball, Hill, Astle, king's, square, White, Mountains, Mount, Washington, Regional, Airport, Economic, development, corporation. Whitefield, NH, New Hampshire, Mountain, View, resort, hotel, golf, course, country club, Spalding, Inn, Spaulding, Kimball, Hill, Astle, king's, square, White, Mountains, Mount, Washington, Regional, Airport, Economic, development, corporation.